Put the flour with the salt in a bowl. Add the butter (room temperature) and cut in small pieces (1/4”). Mix together in a mixer or by hand until you obtain a sand-like texture. Add water and continue mixing until the mixture forms a ball. Let rest at room temperature for at least 20 minutes. Put the batter into the pan, cover with parchment paper and fill with dried white beans. Bake at 375º F for 15-20 minutes (Until sides start to get lightly brown), then remove the paper and the beans and continue baking until the bottom of the crust is lightly brown 10-15 minutes. Boil the cream in a pan, remove from heat, add the chocolate and mix with a wisk until smooth. 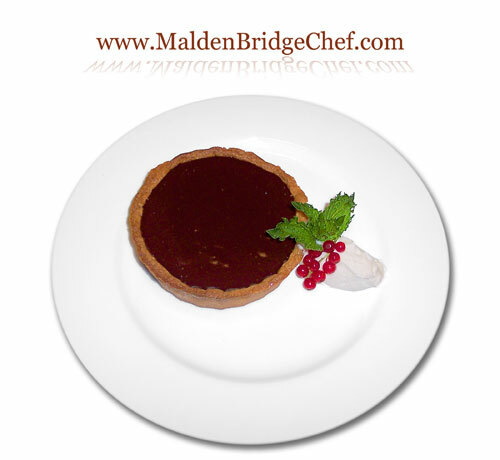 Cook the crust “a blanc.” Add the warm Ganache on the top and refrigerate.